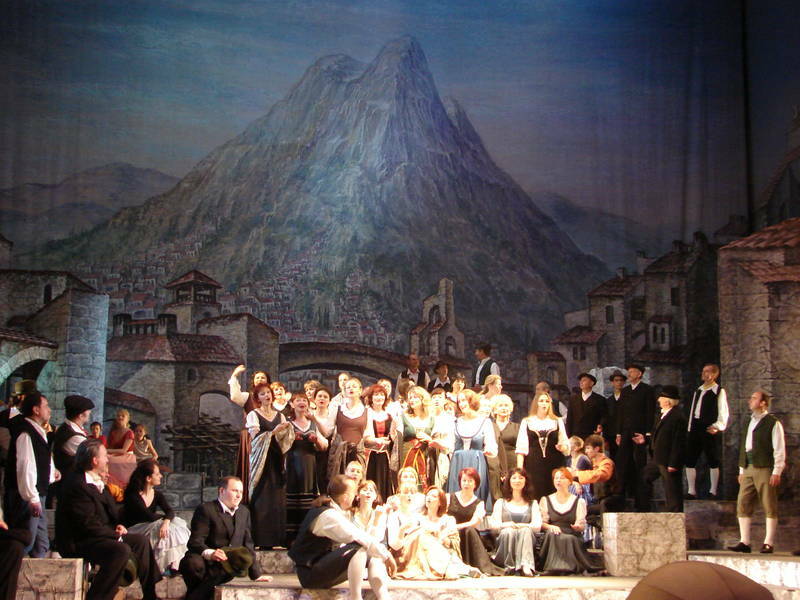 A synopsis of Cavalleria Rusticana by Pietro Mascagni is readily available on the internet. But, did you know that Opera Houses around the world often add and delete creating their own unique versions of operas? 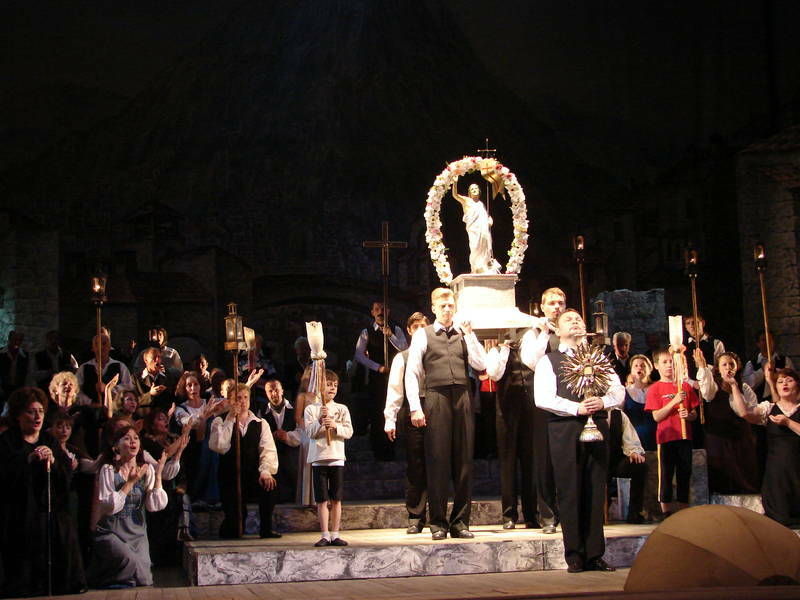 as performed in repertoire at the Lviv Opera House in Lviv, Ukraine. 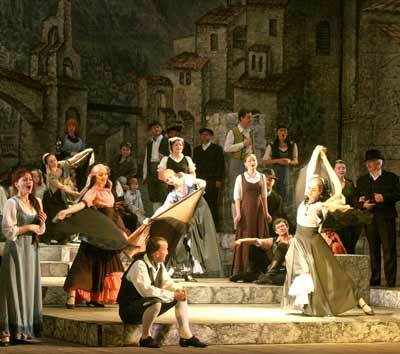 What is the story in the opera Cavalleria Rusticana? It is early morning on Easter Sunday. We are in a Sicilian village at the end of the nineteenth century. Turiddu, a young villager, can be heard offstage. He sings of his love for the married Lola, whom he courted before leaving to serve in the army. As the curtain rises, we see villagers coming into the square. They rejoice because it is Easter morning and a time of spring and love. Slowly, the villagers drift away and the square is left empty. Santuzza, a young village girl, who has been seduced by Turiddu, appears. At this moment, Mamma Lucia, Turiddu's mother, comes out of her taverna. Santuzza asks for news of Turiddu. Mamma Lucia replies that he has gone to Francofonte to pick up a wine shipment. Santuzza contradicts her, claiming that Turiddu was seen in the village last night. 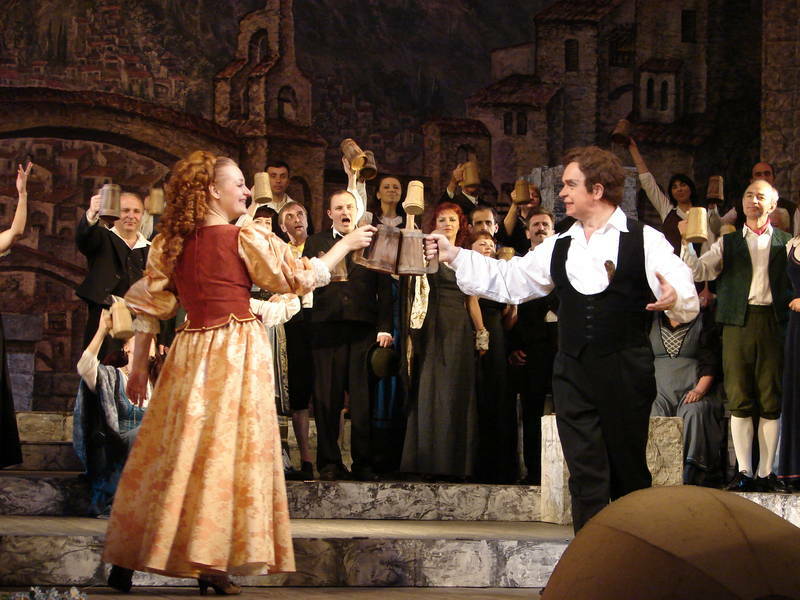 Santuzza and Mamma Lucia are interrupted by the arrival of Alfio, the village’s wealthy teamster. He has recently married Lola and is looking forward to reuniting with her after his travels. Surrounded by his cronies and friends, Alfio sings of his great life. As the villagers leave, Alfio asks Mamma Lucia if she has any good wine. She replies that Turiddu has gone to buy a fresh supply. Alfio expresses surprise, since he saw Turiddu near his home that morning. Santuzza stops Mamma Lucia from asking further questions. The Easter service begins. The villagers join a religious procession and sign a hymn. At the end of the hymn, everyone enters the church. Mamma Lucia and Santuzza remain alone. Santuzza recounts her bitter story: Before leaving to serve in the army, Turiddu was engaged to Lola. He returned to find Lola married to someone else. And so, Turiddu became involved with Santuzza. But, Lola became envious and jealous. She enticed Turiddu back to her. Mamma Lucia is shocked by the story. As she enters the church, Mamma Lucia promises to pray for Santuzza. Turiddu enters. Santuzza confronts him. Turiddu angrily rejects her, telling her that he will not be a slave to her jealousy. Santuzza professes her love for Turiddu. Lola is heard offstage. She arrives on her way to church for the Easter service. Lola flirts with Turiddu. Santuzza reminds Lola that it is Easter and that God sees all. Lola enters the church. Turiddu and Santuzza renew their quarrel. Turiddu accuses Santuzza of spying on him and angrily flings her to the ground. Turiddu leaves to enter the church, while Santuzza curses him. Alfio enters. 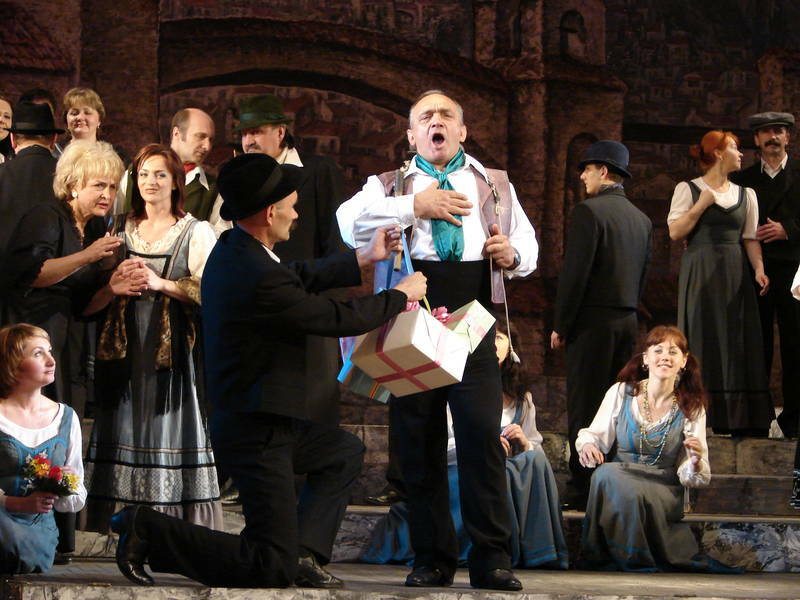 Santuzza reveals to Alfio that Lola, his wife, has been unfaithful to him with Turiddu, who had promised to love Santuzza. Angered, Alfio swears revenge and storms out. Santuzza remains on stage. Childhood dreams, youthful asprirations and cruel realities are portrayed in a ballet sequence to the music of the famous Intermezzo. The Easter service is over. The villagers leave the church and sing about the joys of the day. Lola and Turiddu exit the church and enter the village square. Turiddu invites everyone for a drink of wine and offers a toast to Lola. Alfio enters. Lola approaches him and he publicly rejects her. Lola leaves. Turiddu offers Alfio a drink. Alfio rejects it. According to Sicilian custom, Turiddu and Alfio embrace and Turiddu bites Alfio's ear. The challenge has been made and accepted. Alfio says he will await Turiddu and leaves. Turiddu panics. He calls for his mother, Mamma Lucia, and tells her that he has drunk too much wine. He asks for her blessing. In a fit of guilt, Turiddu appeals to Mamma Lucia to take care of Santuzza, if he should not return. Turiddu exits. Not understanding the meaning of her son’s words, Mamma Lucia is terrified. Santuzza rushes in. The two women embrace. 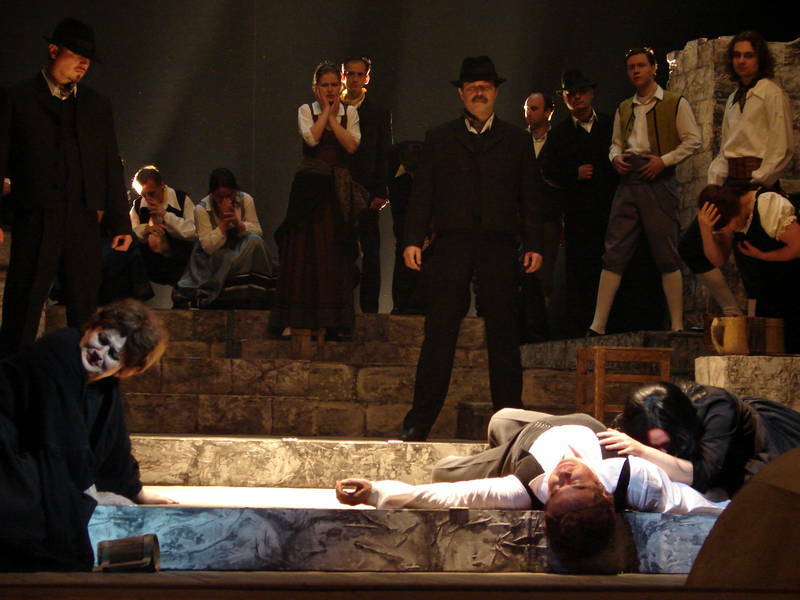 Turiddu’s body is dragged onstage by Alfio’s cronies. And so ends our synopsis of P. Mascagni’s Cavalleria Rusticana as performed at the Lviv Opera House and conducted by Myron Yusypovych.